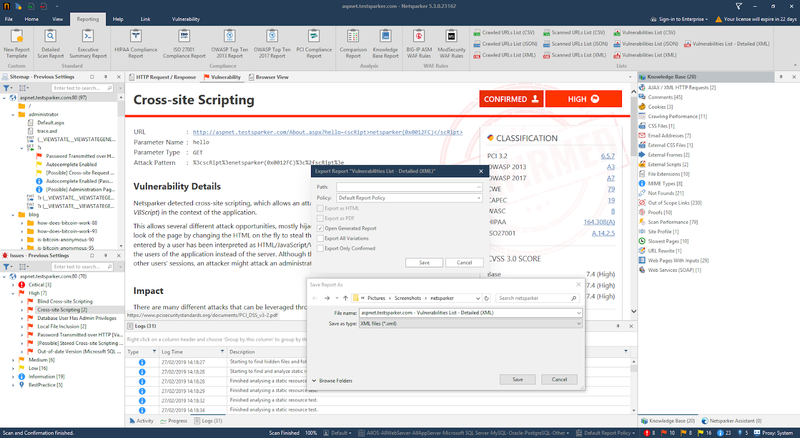 In Netsparker Standard, you can generate and download different types of lists, based on scan findings, in various file formats. This table lists and explains the List options. This is a list of the crawled URLs in a scan, in a CSV file format. This is a list of the crawled URLs in a scan, in a JSON file format. This is a list of the crawled URLs in a scan, in a XML file format. This is a list of the scanned URLs in a scan, in CSV file format. This is a list of the scanned URLs in a scan, in JSON file format. This is a list of the scanned URLs in a scan, in XML file format. This is a list of the vulnerabilities found in a scan, in CSV file format. This is a list of the vulnerabilities found in a scan, in JSON file format. This is a list of the vulnerabilities found in a scan, in XML file format. This is a detailed list of the vulnerabilities found in a scan, in XML file format. From the ribbon, select the File tab. Recent scans are displayed. Click on the relevant scan. From the ribbon, select the Reporting tab. The Lists are displayed. Select the list you want to download. The Export Report dialog and the Save Report As dialog are displayed. In the Export Report dialog, click Save.